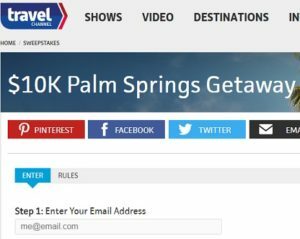 Enter the Travel Channel $10k Palm Springs Getaway and you could head to the very hip and trendy Palm Springs for a desert getaway in luxury! 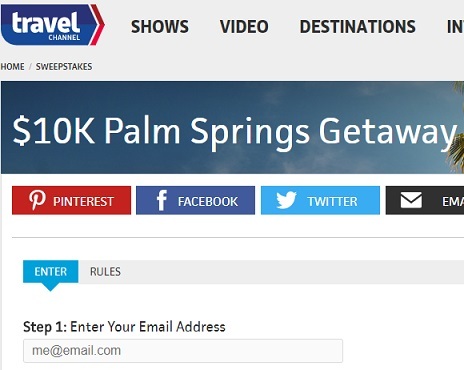 The weather is cooling down across the country, so this could be the perfect time to head to a hotter climate in the oh so fabulous Palm Springs. Palm Springs is a playground for the rich and famous to hang out and relax in upscale luxury away from the hustle and bustle. The travel channel has so of the most amazing vacations available each and every month a new on to enter! I love the opportunity to travel and travel sweepstakes like this open up opportunities to those of us who can’t afford to book these fancy getaways. 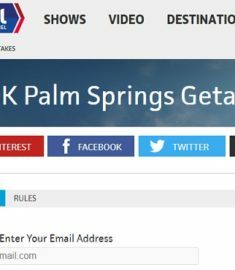 I have yet to travel all the way to Palm Springs, but this sounds like a really stunning location. I’m pretty sure I need to leave the kids at home to truly enjoy this kind of vacation. I am envisioning poolside relaxing with a book and margarita.